The Team One Toyota VIP Plan is included with every new Toyota purchased or leased as well as every pre-owned vehicle purchased at Team One Toyota. This is a $2,000 advantage we give you at no additional cost! We know your time is valuable and to make the buying process as efficient as possible we will give you pricing and payments in 15 minutes! Who wants to spend all day at a dealership buying a new vehicle? To get you in and out as quickly as possible we've tailored our process so we can provide vehicle delivery in one hour! We truly value your business and want to see you come back to the dealership for your next purchase and all of your service needs! To help make that easier for you we provide a valuable money saving coupon and discount book at the time of delivery. Lifetime Non-Factory Powertrain Warranty - The Team One Toyota No Cost Lifetime Non-Factory Powertrain Warranty is a separate warranty that picks up once your Toyota Powertrain warranty expires and lasts for the lifetime of your ownership of that vehicle. *Good at participating dealerships. Now, the next step is crucial. How can you be sure to make the best choice? That's where we come in with QCertified. There are cars, then there are QCertified cars. What's the difference? Plenty! Every vehicle must meet or exceed exacting inspection and reconditioning standards in order to become "QCertified." To make sure that each QCertified vehicle is in strict compliance with our tough standards, a nationally know independent 3rd party randomly evaluates QCertified dealership to be sure. As part of the QCertified process, each vehicle is put through a comprehensive vehicle history evaluation from AutoCheck, by Experian Automotive. QCertified owners receive a one year membership to Road America's Auto Assist program, providing roadside assistance, towing, emergency travel expense reimbursement, gas delivery, tire hazard protection and lockout benefits. Plus, every vehicle is delivered with the original vehicle manufacturer's owner's manual. New Toyota VIP Plan - *Only valid with new Toyota vehicles. All discounts through Team One Toyota. Lifetime Non-Factory Powertrain Warranty good at participating dealers. 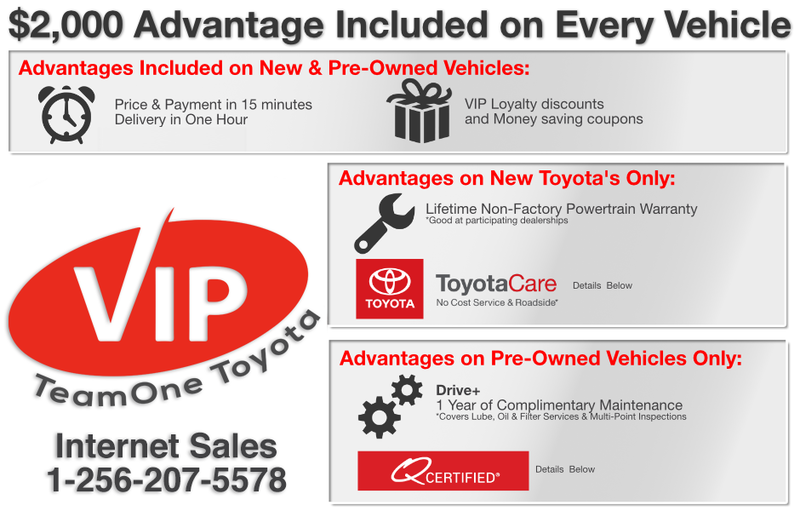 The VIP Plan provides additional coverage after ToyotaCare expires. VIP benefits are non-transferrable. Factory recommended oil changes totaling $247.85 and Limited Non-Factory Powertrain warranty $1850. Loyalty discounts equals $2,097.85. See dealer for details. Pre-Owned VIP Plan - *Not all vehicles will qualify for Drive+ or QCertification. Drive+ excludes luxury brands. QCertification - vehicle must be 7 years old or newer and vehicle must have less than 90,000 miles. excludes luxury brands. Complimentary maintenance must be preformed at Team One Toyota of Gadsden. All discounts provided through Team One Toyota. VIP benefits are non-transferrable. See Dealer for complete details.